25mm/1" - Lowering blocks are legal in all Australian states, subject to complying with ADR regulations. Kits include Ubolts, nuts & instructions - individual Ubolts available seperately. 38mm/1.5" - Lowering blocks are legal in all Australian states, subject to complying with ADR regulations. Kits include Ubolts, nuts & instructions - individual Ubolts available seperately. 50mm/2" - Lowering blocks are legal in all Australian states, subject to complying with ADR regulations. Kits include Ubolts, nuts & instructions - individual Ubolts available seperately. 63mm/2.5" - Lowering blocks are legal in all Australian states, subject to complying with ADR regulations. Kits include Ubolts, nuts & instructions - individual Ubolts available seperately. 75mm/3" - Lowering blocks are legal in all Australian states, subject to complying with ADR regulations. Kits include Ubolts, nuts & instructions - individual Ubolts available seperately. 88mm/3" - Lowering blocks are legal in all Australian states, subject to complying with ADR regulations. Kits include Ubolts, nuts & instructions - individual Ubolts available seperately. 100mm/4" - Lowering blocks are legal in all Australian states, subject to complying with ADR regulations. Kits include Ubolts, nuts & instructions - individual Ubolts available seperately. 125mm/5" - Lowering blocks are legal in all Australian states, subject to complying with ADR regulations. 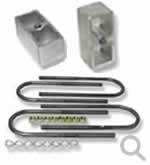 Kits include Ubolts, nuts & instructions - individual Ubolts available seperately.